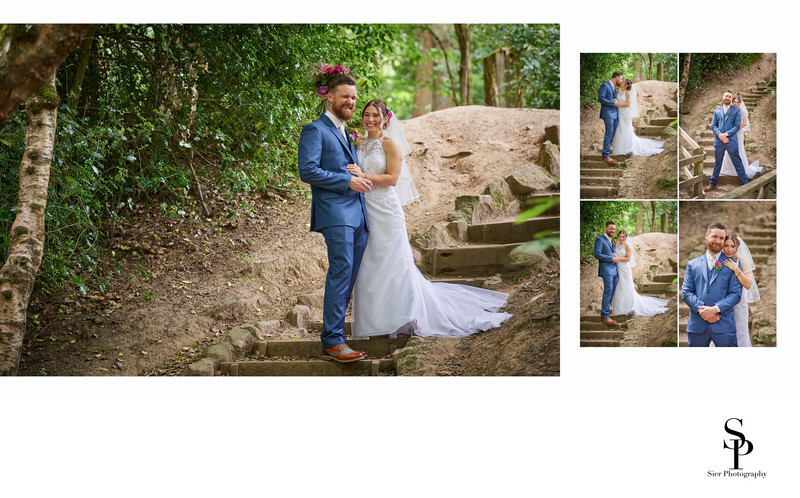 This wedding album page is produced form images captured following a wedding at the JG Graves Woodland Discovery Centre in Ecclesall Woods on the outskirts of Sheffield. This is a fantastic wedding venue and one of the few in the region area offering this type of unusual outdoor setting. The wedding itself still took place indoors as it was a legal requirement that wedding services could only take place inside a fixed structure or building, but with the large doors wide open to the outside, it was almost the same as being outside. Our bride and groom can be seen here having some fun while posing for some light-hearted pictures following their wedding. We don't ask our couples to position themselves in "posed" situation which frequently look contrived, instead, we prefer to place our couples in an area and just let them be themselves. This will always produce much more natural looking images as the couple will be acting naturally, not in some ridiculous, contorted (and probably uncomfortable) posture just because the wedding photographer thinks it "looks cool". Wedding photographers sometimes need to remember who is paying for whose services, the photographer is working for the client, not the other way around!